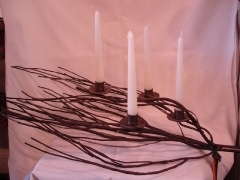 Unique,serene feeling hand-crafted wrought iron branch that holds four tapered candles. Size: 29" long, 17" wide, 6" high. Beautiful for dining table, sideboard, coffee table and use indoor and outdoor.